This isn’t quite what UNLV’s marketing department had in mind when it came up with the slogan “Light The Fuse” for the 2016 football season. After dropping a 33-30 overtime game to Idaho on Saturday night at Sam Boyd Stadium, red-faced Rebel head coach Tony Sanchez wasn’t pulling any punches in his post-game press conference. “I’m pissed. I’m beyond frustrated. I’m embarrassed,” Sanchez said. “I’m pissed off. I’m sick to my stomach right now. This is about as angry as I’ve been since I’ve been sitting in this chair. It’s the kind of loss that has become all too common over the years for the Rebels. A game that on paper – UNLV was a rare 14½ point favorite at home playing a Vandals squad that is headed to the FCS and had been outscored 115-20 in its previous two losses against Washington and Washington State – seemed like a gimme and vital to he team’s hopes of getting to six wins and a bowl game this year. Instead, the Rebels (1-3) limp into the start of Mountain West play with a three-game losing streak looking very much like a team going backward. Wide receiver Callen Hightower caught a crossing pass from Matt Linehan and sprinted 11-yards for the game-winning touchdown in overtime for Idaho. 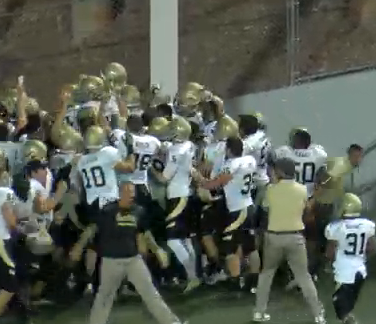 The Vandals had won toss to start OT and started on defense, holding UNLV to a 23-yard Evan Pantels field goal. Linehan, whose deep throws brought back memories of baseball pitcher Tommy John for their lack of velocity, somehow found a way to continually shred UNLV’s secondary, completing 17-of-35 passes for 249 yards and a touchdown. He also ran 7-yards for another touchdown that gave Idaho a 27-20 lead with 6:14 left in the fourth quarter. “We were atrocious covering the deep ball,” Sanchez said simply. But UNLV came right back to tie it 65 seconds later on a 55-yard touchdown run by Lexington Thomas. Thomas also had a 3-yard TD run and finished with 160 yards on 19 carries. The Rebels had a chance to win it late in regulation, driving to the Idaho 43 before having to punt despite Thomas not getting a carry on any of the team’s nine plays. Quarterback Johnny Stanton had a big game running the ball, finishing with 131 yards on 18 carries as the Rebels spent much of the final three quarters running option plays. And for good reason. Stanton struggled mightily passing the ball early, throwing a 31-yard pick-six to linebacker Kaden Elliss in the flat for Idaho’s first touchdown. 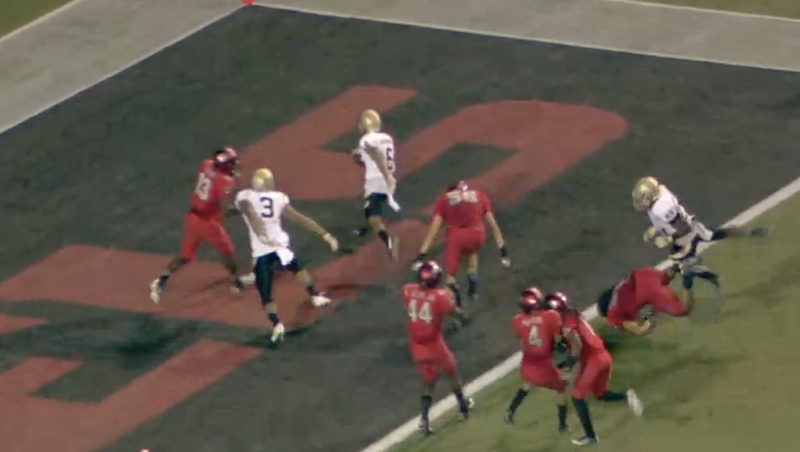 Elliss nearly had another pick-six on a similar play on UNLV’s first possession of the game. Stanton finished 14-of-26 for 175 yards, including a short (and safe) 4-yard touchdown pass to fullback Marc Philippi, and was intercepted twice. Sanchez was asked if there was any thought of replacing Stanton with backup Kurt Palandech after the shaky start? The secondary, a dumpster fire a week earlier in a 44-21 loss at Central Michigan, might be a bigger issue moving forward. Cornerbacks Torry McTyer and Jay’Onn Myles struggled with fundamental coverage issues like turning and facing the ball on deep throws. McTyer was beaten deep for two long passes while Myles was flagged for a key pass interference penalty. “(Defensively) I definitely think we played down to our competition tonight,” safety Troy Hawthorne said. Sanchez said he wanted his team to “chew on” the disappointing loss for 24 hours before moving on to preparation for Fresno State on Sunday night. Just another in a long line in recent UNLV history.